32627 Private John James Close, 14th Battalion, the Durham Light Infantry was killed in action 11 December 1916 and is buried in Cambrin churchyard, France. He was 22 years old and is commemorated on Cockfield War Memorial and the Roll of Honour for Cockfield Council School. John James Close enlisted 19 February 1916 at Darlington into the Durham Light Infantry and was allocated the regimental number 32627. He was initially with the Army Reserve and was mobilized and posted 25 May 1916 to the 14th Battalion, the Durham Light Infantry, “D” Company (14/DLI). At the outbreak of war, the British regular army numbered only 720,000 so Parliament sanctioned an increase of some ½ million men of all ranks. 11 August 1914, the “Your King and Country need you. A call to arms” campaign called for 100,000 men to enlist. This figure was achieved within 2 weeks and these volunteers formed 6 new Divisions of Kitchener’s Army or K1. Within the month over 2,000 men assembled at Newcastle-upon-Tyne and the first recruits left to form the 10th (Service) Battalion of the Durham Light Infantry and the surplus became the 11th Battalion. On the 16th September, another 2,000 recruits left Newcastle-upon-Tyne and these became the 12th and 13th Battalions then another 1,100 went south to billets in Aylesbury, Buckinghamshire to form the 14th Battalion. Another 1,000 plus men assembled to form the 15th Battalion in early October – thus within 2 months of the war commencing, Durham men contributed 6 battalions. Training took place at Halton Park, High Wycombe and Witley Camp. 32627 Private John James Close, 14/DLI was a colliery joiner working at Gordon House Colliery at Cockfield and this employment was considered to be bone fide work essential for the war effort. Not until the end of 1915, did the government consider it necessary to introduce conscription and it seems likely that in February 1916, he was conscripted into the 4/DLI for training then posted to the 14/DLI upon entering France in August 1916. By this time the Battle of the Somme was taking place. 1 July 1916 is a date synonymous with the greatest British military disaster ever – the opening day of the Battle of the Somme. The 14/DLI was not involved in the opening actions at the Battle of the Somme and it did not enter the area until August. The main line of assault ran nearly 14 miles from Maricourt in the south to Serre to the north, with a diversionary attack at Gommecourt 2 miles further to the north. The first objective was to establish a new advanced line on the Montauban to Polizieres Ridge. The first day of the infantry attack was preceeded by a week-long artillery bombardment of the German positions. Adverse weather conditions, the autumn rains and early winter sleet and snow turned the battlefield into morass of mud. Such intolerable physical conditions helped to bring to an end Allied offensive operations after four and a half months of slaughter. The fighting brought no significant breakthrough. Territorial gain was a strip of land approximately 20 miles wide by 6 miles deep. The cost in lives was enormous – British and Commonwealth forces were calculated to have 419,654 casualties (dead, wounded and missing) of which some 131,000 were dead. French casualties amounted to 204,253. German casualties were estimated between 450,000 to 600,000. (14) In the spring of 1917, the German forces fell back to their newly prepared defences, the Hindenburg Line, and there were no further significant engagements in the Somme sector until the Germans mounted their major offensive in March 1918. 2 August 1916: 14/DLI entrained at Esquerdes to Doullens then marched to huts at Acheux Wood and commenced attack training. 14 August: the battalion went into the line north east of Hamel and the Germans fiercely bombarded the trenches. 25 August: There was a failed raiding party attempt. 26 August: The battalion went to Vignacourt for more training. 24 September: As was customary, the offensive commenced with an artillery bombardment which opened up. On this occasion, the Germans had no time to deepen their trenches or prepare deep dugouts, concreted machine gun posts and massed belts of barbed wire. 25 September: The infantry went over the top. The offensive coincided with a French assault to the south. The Royal Artillery blasted a “creeping barrage” and the infantry followed into No Man’s Land. Tanks were to be used in the attack behind the troops and concentrated their fire power on specific strong German positions. The village of Gueudecourt was still holding out as night fell. The real success was to the right on the front where the XIV Corps, packed into a narrow frontage to maximise their penetrative power and they swept forward to dramatic effect, eventually capturing the whole of the German front line system. The objectives of Lesbouefs and Morval were taken. In many places along the line the troops of the XIV Corps met little opposition from front line Germans. 26 September: The village of Combles was left isolated and the Germans had to abandon it. Gueudecourt was overrun on the afternoon. 14/DLI went to the front line east of Lesboeufs. By the conclusion of this offensive, the final objectives had been achieved and additional land had been captured beyond the villages of Lesboeufs and Morval. The British battlefront extended from the region of Leuze Wood, east of Guillemont to the vicinity of Martinpuich. 12 September: 6am: General bombardment of the German lines began. The 14/DLI moved up from Sand Pit Valley to the Citadel, south of Fricourt. Later in the day, the 18th Brigade rushed into the Quadrilateral from the flanks and the 2/DLI entered a trench called Low Road, bombed it down for 100 yards and held on. At night the 14/DLI were sent forward from Guillemont to consolidate a position where the railway crossed the Ginchy-Leuze Wood road. The trenches were full of dead and wounded Norfolks and Suffolks. 13 September dawn: patrols sent out to locate troops on the flanks. Further fighting to the north where the Guards attacked Lesboeufs. The 14/DLI began work on an assembly trench in front of their position for another attempt upon the Quadrilateral. 14 September early morning: heavy enemy barrage, counter attack expected, did not happen, resumed work on the trench. 18 September: intense bombardment of the German positions by the British artillery. Rain began to fall. “German machine-gunners maintained a galling fire”. Rifle grenades were used and the machine guns were soon in British hands. The Straight and the Quadrilateral were taken, the advance pressed on. North of the railway, the 14/DLI bombed out dug-outs and reached the forward slope in view of Morval. The battalion dug in. The expected enemy infantry counter attack did not materialise but German gunners opened fire on the new positions. At night, the whole brigade was relieved and the 14/DLI reached billets at Meaulte, the following day. 21 September: a draft of 80 men had been received before the 14/DLI moved forward again relieving the 1st Guards Brigade in front of Lesboeufs. The night was spent in reserve between Trones Wood and Bernafay Wood. 23 September evening: 14/DLI moved forward and relieved the 2nd Durhams and 11th Essex, taking over the whole of the brigade front just south of Ginchy-Lesboeufs road. The Germans occupied Cow Trench on the left beyond the road. Hostile shell fire. 24 September dawn: the German infantry advanced under intense bombardment. They did not reach the trenches of the 14/DLI. British gunfire prevented further enemy attacks but many shells fell short into the trenches of the 14/DLI. At night, the battalion was relieved by the 2/DLI. Losses 1 officer killed and 10 men wounded. 25 September: the 2/DLI and the 14/DLI participated in the attack along the whole allied front from the river Somme to Martinpuich. The 1st West Yorkshire Regt. were successful in “making good” the village of Lesboeufs but the 14th were not called upon and sat in reserve positions all day under a heavy German bombardment – 1 officer and 2 men killed, 2 officers and 32 men wounded. 18/1628 Private William Edwin Earl 14/DLI who’s parents lived at Buckheads Farm between Evenwood and Cockfield, was killed in action 27 September 1916. He has no known grave and is commemorated on the Thiepval Memorial. It would be highly likely that Privates Close and Earl would be known to each other. 29 September: 14/DLI moved onto Mealute and the focus of the Somme offensive during October moved to the north and the Battles of Thiepval and Le Transloy. The 6th Division and the 14/DLI were heavily involved in the October offensive. Haig’s plan was simple – to keep attacking and load the pressure on the Germans. So another concerted attack was launched all along the Somme front 12 October. The 4th Army attacked along the Le Transloy Ridge, the Reserve Army would thrust forward again on Pozieres Ridge and the Third Army would re-enter the fray with another push against the Gommecourt Salient. General attack – 6th Division towards Le Transloy – by 18th and 71st Infantry Brigades – 16th Infantry Brigade in reserve- unsuccessful. Fresh attack by 71st Infantry Brigade – only partially successful on the left. “…the 6th Division was brought in again on the night 8/9th October for a general attack on the 12th October. The enemy had dug a series of trenches named by us Rainbow-Cloudy-Misty-Zenith etc. a portion of which had been captured by us, making a somewhat pronounced salient. All three brigades were in the line, with one battalion in front trenches, the 71st Infantry Brigade being in the salient, with the 16th on the right and the 18th Infantry Brigade on the left. The objective of the attack of the 12th October was the line of trenches running north from Le Transloy. 7 October: 14/DLI moved to the front and their bivouacs at Trones Wood came under heavy shell fire on the evening – 17 men were killed and wounded. 8 October: the battalion moved into assembly positions for the next attack – the objective was to capture Rainbow Trench and Shine Trench then advance to Cloudy Trench. 12 October: 2.05pm – the advance began under an enemy barrage. The advance kept going and Rainbow Trench was taken. Shine Trench was also captured but the Germans defended the next objective with great resolve. 14 October: 14/DLI was relieved by the 11th Essex. 16 October: British gunners were busy but many of their shells fell short hitting Shine Trench. The 14/DLI was relieved that night and moved back to Montauban, where a draft of 185 men of the 2/1st Derbyshire Yeomanry was absorbed. During the October fighting the battalion lost 7 officers and 182 men and it seems likely that one of those was 14633 Private John Maughan, 14/DLI, from Evenwood Gate who died of wounds 16 October 1916 and is buried at Grove Town Cemetery, Meaulte, France. It would be likely that Privates Maughan and Close would have known each other. Private J.J. Close received a wound 11 October which didn’t appear to need hospital treatment and he stayed at the front. 21 October he suffered a gun shot wound to the back of the head and he was taken to Etaples for treatment. He returned to the battalion 31 October. It is likely that the experiences of Privates Close, Maughan and Guardsman Horace Calvert were similar. Returning to the Battle of Morval, analysis appears to conclude that the tactic of “bite and hold” was successful in this instance due to a combination of factors – an effective preliminary bombardment, the “creeping barrage” which provided cover for the infantry and the relatively weak German defences. This concentrated attack with limited objectives was supported by a French offensive to the south which further occupied the German defensive cover. Thus the British edged forward as the Germans edged back and prepared new lines of defence. 29 October: 2 weeks training. 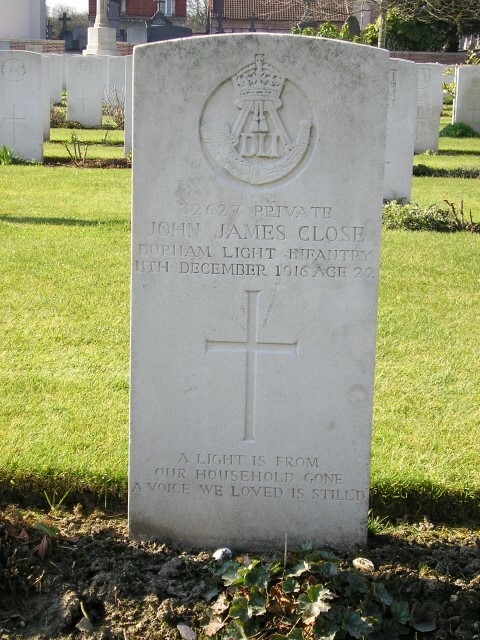 During this period Private J.J. Close was in hospital at Etaples. 31 October: Private J.J. Close re-joined his battalion. The 18th Brigade replaced the 64th in the Cambrin Sector and the 14/DLI worked with tunnelling companies at Noeux-les-Mines, Sailly-Labourse and Annequin. 6 December: relieved the 1/West Yorkshires in the front line at Cambrin, just south of the la Bassee canal. 10 December: 2/Lt. R.H.C. Macdonald with 8 men attempted to enter the German trenches but the enemy was on the alert and opened fire. Most of the party were hit, the officer being mortally wounded. Sergeant R.T. Young and Corporal T. Jaye showed great courage in attempting to recover him and both received the Military Medal. Was Private J.J. Close involved? The letter below dated 2 December 1916 and was written to Private Close’s older brother George – it was his last letter home. Just a few lines to let you know that I received your nice box quite safe and sound and I am very pleased with same, many thank to you and the wife. I am sorry to hear that you have got a bad back and I hope it will soon be better. I was quite in luck’s way today as I got a large box of stuff from home containing amongst other things a gold hunter and handkerchiefs so you see I am well off for handkerchiefs now. The box just came at the right time as we are going into the trenches any time now we might get out again for Xmas if we are lucky. The weather out here is getting quite cold but we can’t expect any better weather for the time of the year. I am pleased to hear of a zeppelin being brought down in the county of Durham it shows they are not quite asleep after all. Well George I haven’t much news to tell you I am quite well and in good health so I will close wishing you, the wife and the children a merry Christmas. I remain your loving brother. 12 May 1917: the “effects” of Private J.J. Close were forwarded to his mother, Mrs. Ann Close but the Hunter watch was not returned to the family. Later correspondence relates to the award of a “Dependants’ Pension” and the memorial plaque and scroll in commemoration of Private J.J. Close was forwarded to the family sometime after August 1919. Cambrin Churchyard extension: Private J.J. Close is buried at grave reference S. 38. Cambrin is a village about 20 miles north of Arras and above 6 miles east of Bethune on the road to La Bassee. At one time the village of Cambrin housed brigade headquarters but until the end of the war it was only about 800m from the front line trenches. The village contains 2 cemeteries used for Commonwealth burials – the churchyard extension taken over from French troops in May 1915 and the Military Cemetery behind the Mayors House. The churchyard extension was used for front line burials until February 1917 when it was closed, but there are three graves of 1918 in the back rows. Cambrin Churchyard Extension contains 1,211 Commonwealth burials of the First World War. Various sources including CWGC, “The Somme” P. Hart; http://www.1914-1918.net.